Hey there tabletop gamers! There’s a whole world of games out there just waiting for you to add them to your collection. Most of the time, when you’re picking up a new game you need to consider things like theme, mechanics, genre, and what sort of gamers your friends are but right now, those rules simply don’t apply. Instead, we’re taking a look at some of the rarest, priciest games in existence. Memorize these names folks, because if you happen upon any one of these at a garage sale you need to jump on them. And fast. 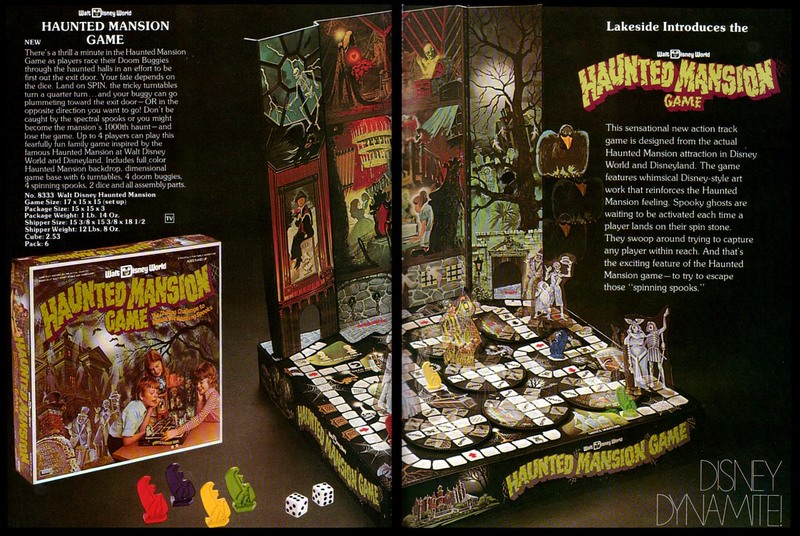 Disney’s Haunted Mansion Game: Released only a couple of years after the ride itself opened, this 1970s game pitted 2-4 players against each other and the ever-changing floor plan of the mansion itself. Why it’s rare: Though the game was released twice, in 1972 and 1975 respectively, there simply aren’t enough complete games to satisfy demand. The Haunted Mansion itself is crazy popular, and this game really captured the creepy, fun atmosphere of the ride well. Trafalgar: The battle of Trafalgar has been simulated numerous times, but Roger Corimer’s 1960s self-produced version tops the rarity charts (so much so that even our picture isn’t of the game itself). The game comes with no box: the “board” is made of felt, and the “ships” are the most basic of markers. Don’t let aesthetics fool you though, this thing was highly playable. Why it’s rare: Word on the street is that only 450 of this 1968 no-frills nautical simulator were ever produced. On top of that, Corimer had trouble even getting those few to their owners, so a number of prospective owners lost out on getting their copies even back when this game was available. Star Wars: The Queen’s Gambit: Play as either the trade federation or the Naboo as you reenact the four-fold climax of Star Wars: The Phantom Menace. Why it’s rare: It’s great, highly complex, and happens to come with 155 individual pieces, a 3D Theed palace, 16 dice, and 180 cards. Sure it was released in the comparatively recent year 2000, but prying one of these suckers from the hands of another Star Wars fan will still cost you. Dark Tower: Released in 1981, this was Milton Bradley’s take on the fantasy craze of the 1970s and 80s. Centered on an electronic tower which players had to unlock with collected keys, this one was fun for 1-4 players. Why it’s rare: Remember when I said that it was Milton Bradley’s take on the 1980s fantasy genre? Turns out the company straight up stole the idea—tower specs and all—from two independent inventors. They sued, winning a cool $700,000 and removing the plagiarized game from shelves. Fireball Island: Since we’re talking about games from the 80s, it’s only fair to mention the cream of the crop. Played on a 3D board, the fun of Fireball Island is in hurling its red marble “fireballs” at your opponents, leaving them itemless and near death in one of the island’s numerous smoldering pits. Why it’s rare: This game was designed for kids 7 and up, fairly often resulting in some seriously zealous fireballing. I, for instance, actually severed an arm from an opponent’s piece during an over-excited assault. The Campaign For North Africa: Of all the war games in existence, this one is by far the most complex. It takes 1500 hours to complete and you’ll need two teams of five players each to do so. The rule book comes in three hefty volumes, for crying out loud. Why it’s rare: 1800 pieces is a lot to keep track of, and pretty much nobody really wants to sit down to a full play through of this sucker. War of the Ring: Collector’s Edition: The most recent item on our list, this beautifully complex game came out in 2010. The collector’s edition also includes items from the game’s expansion and a leather bound instruction manual. Why it’s rare: Two waves of the collector’s edition were produced, each limited to 1000 units each. The hand-painted game pieces alone justify a steep market for these suckers. Swift Meats Major League Baseball Game: In 1957, the Swift meat packing company came up with a way to encourage kids to eat their meat. If you sent away for it, the game included a playing board and 18 cardboard players. Why it’s rare: Direct mail paper products from the 1950s pretty much covers it, but don’t forget that collectors are also looking for sets that never had the players punched out or assembled. Price: The board alone recently sold for over $900, and the cards can run you $400 without it. Jati: As rare games go, this one’s pretty well known for being hard to get. Never officially released, it was only ever a “candidate.” A simple tile placing game, Jati isn’t too complex, and it’s also reported to be only so-so as far as fun factor goes. Why it’s rare: There are varying theories on how many of these were ever produced. Some say 100, while others put the number closer to 1000. Either way, that’s not a lot of supply for such a coveted game. Agent of Change: Published in 1991, this is the holy (g)rail of crayon railroad games. Designed to be historically and geographically accurate, the game shows players what it was like to be a railroad tycoon in West Virginia. Why it’s rare: This game was a special edition published only for the Huntington museum of art in West Virginia, during a specific exhibition. That’s a pretty small window of opportunity. Know of a rare game we didn’t mention? Give it some love in the comments!